*Bennie is out of stock - please feel free to pre-order while in production. Bennie is unreal! These sunnies are made from 5-ply maple recycled skateboards, making them strong yet lightweight. Fitted with blue polarised mirror lenses, engraved logos and stretch to fit spring hinges. *Please note each individual pair will vary as they have their own unique grain patterns. 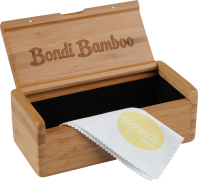 Each pair of sunglasses from Topheads Eyewear comes with a solid bamboo case, microfiber lens cloth and a travel pouch.